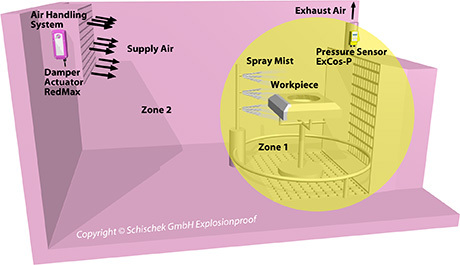 Areas with potentially explosive atmospheres are divided into zones, equipment has to be divided into groups and categories. The labelling on the identification plate of certified equipment indicates in which zone the explosion protected equipment can be used. Equipment is divided into group I and group II. Group I consists of underground mines and group II deals with all other applications. Areas with potentially explosive atmospheres are divided into six zones according to the probability of how frequent and for which period of time a potentially explosive atmosphere (p.e.a.) exists. A distinction is made between combustible gases, mists, vapors and combustible dust. For gases, mists and vapors zones 0, 1 and 2 exist, in which the requirements for the chosen equipment increase from zone 2 to 0. Equipment in zone 0 must be built in a way "that even if a type of protection fails or if two faults occur, that sufficient explosion protection is guaranteed". Therefore for example a passive, potential free sensor, installed in zone 0, and connected to an intrinsically safe electric circuit (II 2 (1) G [Ex ia] IIC), needs its own approval. Zones 20, 21 and 22 are for dust atmospheres, in which the requirements for the chosen equipment increase from zone 22 to 20. Equipment in zone 20 and 21 need special approval. Example of a typical zone activity would be filling a barrel of petrol in an enclosed area. Example of a typical zone activity would be filling a grain silo in an enclosed area. Equipment groups determine, in which zones the equipment may be installed. Once again there are six categories. 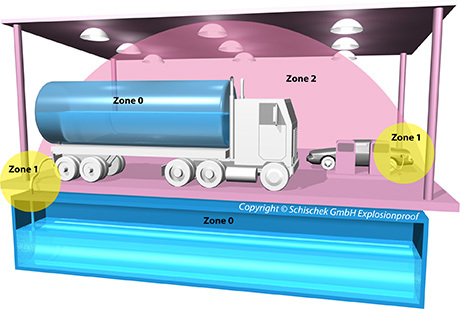 Categories 1G, 2G and 3G are classifications for gas explosion protection (G = Gas); thereby 1G equipment is suitable for use in zones 0, 1 and 2, 2G equipment is suitable for use in zones 1 and 2 and 3G equipment is suitable for use in zone 2. Categories 1D, 2D and 3D are classifications for dust explosion protection (D = Dust); thereby 1D equipment is suitable for use in zones 20, 21 and 22, 2D equipment is suitable for use in zones 21 and 22 and 3D equipment is suitable for use in zone 2. The equipment groups and categories determine, in which zones the equipment may be installed, whereas the explosion groups and temperature classes determine, for which mediums inside the zones, the equipment is suitable. The type of protection used is not a mark of quality but is instead a constructive solution for selecting equipment for explosion protection. pheres). The equipment requirements increase from IIA to IIC. ment design requirements increase from T1 to T6.